Foot - Visual Dictionary - Copyright © 2005-2016 - All rights reserved. [img]https://infovisual.info//storage/app/media/03/img_en/032-foot-plantar-view.jpg[/img] [url=https://infovisual.info/en][/url] - [url=http://www.infovisual.info/]Visual Dictionary[/url] - Copyright © 2005-2016 - All rights reserved. Foot (plantar view): five-toed organ at the end of a human leg that supports the body and is used for walking. Talocalcaneal ligement: strong, dense fibrous tissue connecting the astragalus and the calcaneum. Calcaneus: projecting bone of the tarsus that forms the heel. 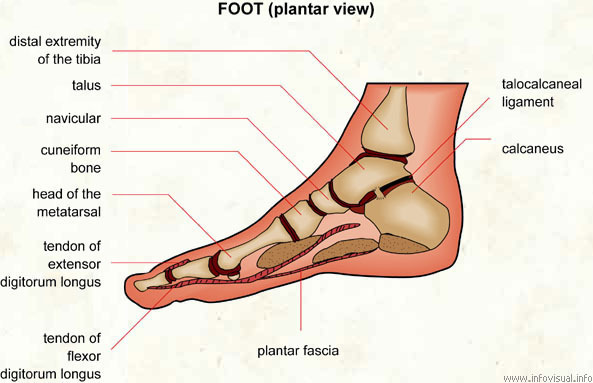 Plantar fascia: membrane enveloping the muscle in the plantar area of the foot. Its extension attach the bones to the muscles. Tendon of flexor digitorum longus: tissue that attaches the flexor longus digitorum to the third phalange. Tendon of extensor digitorum longus: tissue that attaches the extensor longus digitorum to the third phalange. Head of the metatarsal: end of the metatarsal bone. Cuneiform bone: central bone of the tarsus. Navicular: small, boat-shaped bone of the foot. Talus: bone of the tarsus that is jointed with the fibula and the tibia. Distal extremity of the tibia: the end of the tibia closest to the foot. A nail is a horn-like piece at the end of a finger. Fingernails are made of a tough protein called keratin.